As marketing becomes a revenue driver, companies that have implemented CRM and marketing automation are looking for new insights to take their modern marketing efforts to the next level. Because of this, B2B marketing is undergoing a transformation from reactive to predictive. Innovative marketers are tapping into predictive models and data science to anticipate buyer needs and interests, but this new landscape of tools and tactics can be confusing. How predictive models work - no PhD required! Ready to take the mystery out of predictive analytics? 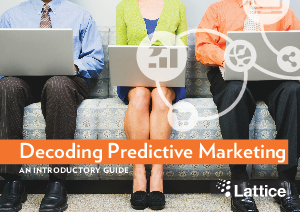 Download Decoding Predictive Marketing.